Sandtray Therapy is an alternative to 'talk' therapy, and is used as a communication tool to promote change. It incorporates elements of play therapy and analytic work. Using a tray filled with sand and miniature figures, you can create a scene or picture which can facilitate resolution of conflict or can promote awareness of unconscious processes. This technique is particularly helpful when someone cannot find words to express their feelings. Dialectical behavior therapy (DBT) is a form of psychotherapy that was originally developed to treat people with borderline personality disorder (BPD). DBT combines standard cognitive-behavioral techniques for emotion regulation and reality-testing with concepts of distress tolerance, acceptance, and mindful awareness. Eye Movement Desensitization and Reprocessing (EMDR) is a structured therapy that encourages the patient to briefly focus on the trauma memory while simultaneously experiencing bilateral stimulation (typically eye movements), which is associated with a reduction in the vividness and emotion associated with the trauma memories. This integrative psychotherapy approach that has been extensively researched and proven effective for the treatment of trauma. Lorrie is the founder of GPCC, she opened the practice in 2003. GPCC is the longest established private practice in the Gainesville, Haymarket, Bristow area. 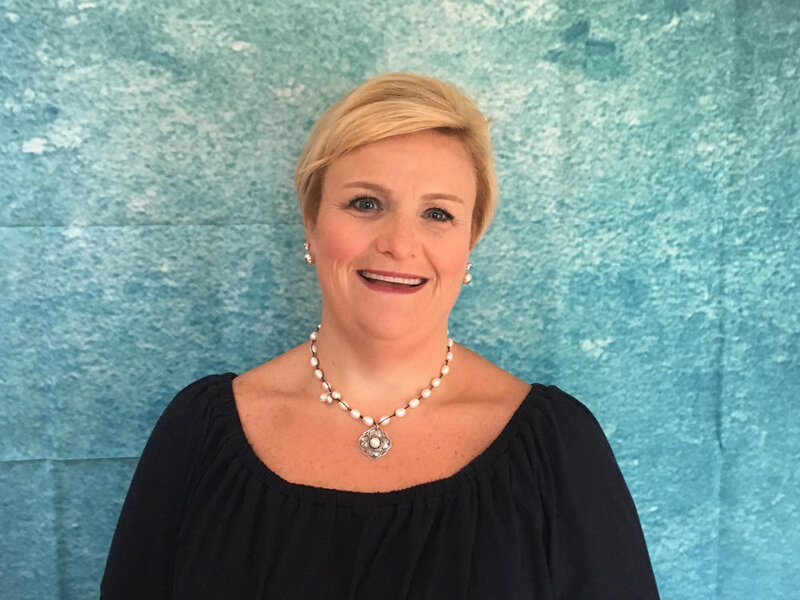 She is licensed by the Commonwealth of Virginia as a Licensed Professional Counselor and is nationally certified by the National Board of Certified Counselors. Lorrie received her bachelor’s degree with a double major in Psychology and Social Sciences as well a master’s degree in Counseling Psychology from Radford University. She is an active of member of Psi Chi, The National Honor Society in Psychology. Lorrie has 26 years of clinical experience. She has worked as an elementary school counselor and a private practice therapist in Northern Virginia. Her strengths are working with individuals dealing with issues of depression and anxiety as well as stress management, coping and communication skills, adjustment issues and Women's Issues. Lorrie is also a Lyme Literate Therapist. Lorrie conducts all of her Therapy sessions by videoconference using Telehealth. Lorrie currently resides in Gainesville with her husband and children. Carol Blechl is a licensed clinical social worker who brings over 20 years of clinical experience to the GPCC practice. Carol received both her bachelor’s degree (1991) and her Master’s degree (1994) in Psychology from State University of New York-College at Brockport. She later earned a second master’s degree in social work from Virginia Commonwealth University in 2000.She has been a licensed provider in the state of Virginia since 2005. Carol has specialized expertise in working with trauma, depression, anxiety, adjustment disorders, relationships issues and situational stress in diverse adult populations. She uses an individualized and collaborative approach with her clients and is committed to helping each on his or her unique journey toward wellness. Her clinical approaches include Cognitive-Behavioral Therapy (CBT), Solution-Oriented Therapy, attachment focused EMDR and Dialectical Behavioral Therapy (DBT). Carol lives locally with her husband and children. Crystal is a Licensed Professional Counselor. Crystal has graduated from Liberty University with her Masters in Professional Counseling and a Masters in Education for School Counseling. She has also received training in Health and Wellness Coaching as well as Life Coaching. Crystal has worked in the field of elementary education for 10 years and continues as a classroom teacher as she pursues her goal in helping others through the counseling field. Crystal utilizes various modalities and treatment approaches that are a "best fit" for her client's individualized journey in life. She has experience with Cognitive Behavior Therapy, Solution-Focused Therapy, Play Therapy, and Mindfulness. She works with young children, adolescents, and adults, individuals and families who are going through life transitions, women’s issues, depression, anxiety, stress management, coping skills, adjustment issues, and self-esteem/self-image issues. As a LPC, her goal is to aid her clients in understanding their own strength and to realize their ability in developing healthy coping skills while utilizing the resources and supports around them. She enjoys working with clients in discovering a healthier state of well-being. Crystal lives in the area with her husband and two children. Laura is a Licensed Professional Counselor and Nationally Certified Counselor who has been working in the mental health field since 2007. Her undergraduate degree in psychology is from George Mason University. She earned her Master’s degree in Clinical Psychology from Argosy University as well as one in Mental Health Counseling from Walden University. Laura has worked with children, adolescents, and their families in home-based, school-based, hospital and outpatient settings. She has extensive experience with elementary aged children as well as at-risk adolescents in an alternative school environment. Laura also has clinical supervision experience. Her specialization and passion is working with children, adolescents, and young adults (ages 4-21). Laura has training and approximately 7 years of supervised experience with play therapy, and enjoys using an integration of directive and non-directive play therapy techniques that facilitate coping, healing, and learning strategies for emotional, behavioral, and social growth. This treatment approach can be effective in treating anxiety, personal or family adjustment issues, improving social skills, strengthening self-regulation/coping skills,grief, depression, ADHD, defiance, and other behavioral concerns. Laura also has completed a certification course in mindfulness with children and adolescents.Laura enjoys teaching techniques that children and adolescents can use at home, school, or in the community to help them self soothe and get their needs met in a productive manner, while engaging parents and family members with positive parenting strategies and connecting them to community resources as needed. With older adolescents and young adults, she enjoys integrating cognitive behavioral therapy (CBT) with a solution focused approach, that are effective in treating depression, anxiety, phobias, oppositional defiance, and at-risk/delinquent behaviors. Laura is a member of Chi Sigma Iota, the international honor society in counseling, as well as the Virginia Counseling Association and the Association for Play Therapy. Laura resides locally with her husband and two sons. Lauren Aigner is a Licensed Professional Counselor (LPC) in the state of Virginia. She has a bachelor’s degree in Psychology (1993)and a master’s degree in Counseling and Development (1999); both from George Mason University. Lauren has devoted her life to working with youth and families. Her first job, at the age of 15, was in a child care center and she has worked in the human services industry ever since. Lauren received her LPC in 2001 but has over 20 years of experience in the mental health field. She has worked in various settings such as schools, group homes, home based, and outpatient. From 2001- 2019 Lauren worked for Prince William County Community Services in their outpatient clinic serving youth, adults, and families and has experience with diverse populations with a wide spectrum of mental health and behavioral challenges. Additionally she has supervised many master's level clinicians and assisted them with obtaining their own professional licensure. Lauren's primary focus for counseling is with children and adolescents however she also enjoys working with adults. She values and appreciates family involvement in the counseling process when appropriate and believes that the support of others is critical to an individual's progress and success. Lauren typically uses Solution Focused Therapy, Family Systems Therapy and Crisis Intervention as well as other talk therapy approaches. She takes a holistic approach to counseling and believes in the importance of the mind, body, and spirit connection. Other interventions she may use in counseling sessions include art, play, meditation/mindfulness, nutrition counseling, and physical movement. Lauren’s strengths are working with depression, anxiety, anger, behavioral issues, adjustment disorders, parenting, communication, coping, grief, and attention deficit disorders. Lauren lives locally with her husband. Heather has 16 years of experience working with children, adolescents and adults. She is a Licensed Clinical Social Worker in the Commonwealth of Virginia. She received her Master of Social Work from University of Hawaii and an undergraduate degree from Texas A&M University. She worked for many years in Fairfax County in the field of Child Welfare. She has extensive court experience, and has been recognized in local courts as an expert in child development. Prior to GPCC, she was at another private practice in Gainesville. Heather has specialized expertise working with children. Her clinical approach with children utilizes Child Centered and Experiential Play Therapy as well as Cognitive Behavioral Therapy (CBT) and expressive art techniques. She uses a collaborative approach with parents in assisting their children overcome challenges and utilize their strengths. Her treatment modalities with adolescents and adults includes CBT, Solution Focused Therapy and Motivational Interviewing. Heather is a member of the National Association of Social Workers and the Association of Play Therapy. Heather lives locally with her husband and two children. Tara Thomas is a Licensed Clinical Social Worker. She received her bachelor’s degree in social work with a minor in gerontology and sociology from Radford University in 1993 and her master's degree from Fordham University in 1994. Tara is a member of the National Association of Social Workers. Tara has sixteen years of clinical experience in a variety of settings such as hospital-based, homecare, nursing home, and grief and loss. Her current areas of interest are children, depression, grief and loss, stress management, and family counseling. Tara utilizes a spectrum of interventions and techniques including systems theory, strength based, cognitive behavior therapy, client-centered, and play therapy. Tara currently resides in Gainesville with her three children. Erin is a Licensed Clinical Social Worker through the Commonwealth of Virginia. She received her undergraduate degree in Social Work from Monmouth University and continued her education there to earn her Master's degree in Social Work one year later. Erin has worked with children and families for the past 6 years. She has experience in working with children who struggle with issues related to ADHD, anxiety, depression, oppositional defiance, self-esteem, coping skills, communication skills and more. Erin utilizes a strengths-based, goal-orientated approach with a focus on keeping things fun and interactive. She collaborates closely with families in order to effectively navigate through children's needs and incorporates several different techniques into her work including play therapy techniques, art therapy techniques, sand-tray therapy techniques, CBT, and more. Erin's overall goal as an LCSW is to continue to foster the mental, emotional, and overall wellbeing of youth in the area by providing a safe, friendly, and positive environment for children and adolescents. Liz is a Licensed Professional Counselor in the State of Virginia. She is also a Nationally Board Certified Counselor and currently works as a school counselor for Prince William County Schools. Liz received her undergraduate degree in Human Services with a minor in Psychology from Keystone College in 2006. She received her Master's degree in School Counseling in 2011 from the University of Scranton and a Certificate of Advanced Graduate Studies in 2012. Liz is an active member of the Prince William Regional Counselor's Association, the Virginia Counselor's Association, the Virginia School Counselor's Association, and the American School Counselor's Association. Liz has 7 years of experience working with children and adolescents who have behavioral difficulties and were diagnosed with ADD, ODD and Autism. She also worked as an outpatient therapist for a year with adolescents that had a variety of different issues from struggling with their sexuality to substance abuse before moving to Virginia in 2013. Liz currently resides in Manassas with her husband, Joe and dog, Benny. Anna Marie is Licensed as a Professional Counselor as well as Marriage and Family Therapist in the State of Virginia. She has several years of experience in working with individuals to reconnect with their core values; due to core hurts and vulnerabilities from painful and traumatic events may cause one to feel devalued and lose sight of their true value. Anna Marie was mentored and trained by Steven Stosny, PhD, an internationally acclaimed relationship expert, author and psychologist. Anna Marie has extensive experience in working with couples, families and adolescents. She shares a unique approach to helping young children and adolescents find their own value by teaching them compassion, resourcefulness, responsibility, respect, relationship investment and regulation of impulses and emotions. Anna Marie is happy to be joining the team at GPCC and also offers parenting classes and seminars for the workplace. She takes a compassionate approach to her work and believes everyone is born with value and she is committed to helping individuals discover the deepest part of who they are, by reconnecting to their own core value. Anna Marie lives locally with her family. Renata is a licensed eligible mental health professional who is working on her license as an LPC in Virginia. Renata received her undergraduate degree in Psychology from the University of Maryland. She earned her Master’s degree in Community Counseling from George Mason University. Renata has experience working with both adults and teens struggling with a variety of mental health disorders including depression, anxiety, substance abuse, stress management, personal trauma, and identity issues. Renata worked at George Mason University providing counseling to young adults with disabilities for 3 years. Most recently Renata has been working with individuals with serious mental health issues providing individual and family therapy. Renata enjoys helping people and utilizes Cognitive Behavioral Therapy, Mindfulness, and Solution Focused Therapy, along with Motivational Interviewing. Renata is a member of the American Counseling Association and lives locally with her husband, daughter, and a golden doodle. Alicia is licensed by the Commonwealth of Virginia as a Marriage and Family Therapist. Alicia received her bachelor’s degree with a a major in Psychology and Sociology as well a master’s degree in Marriage and Family Therapy from Liberty University. Alicia has 5000+ hours of clinical experience. She has worked as an elementary school counselor, day treatment counselor, in-home therapist and crisis intervention therapist. Her strengths are working with individuals, couples and families dealing with issues of depression, anxiety, stress management, coping, communication skills, and adjustment issues. Alicia currently resides in Bealeton with her husband. Megan is a licensed eligible mental health professional, she is working towards her license as a LPC in Virginia. Megan graduated with her Master’s degree in Clinical Mental Health Counseling at Wright State University, Ohio in 2016. Megan has experience working with adolescents and adults in an outpatient setting and children in a school-based setting. Megan tailors therapy based on client’s goals, utilizing Client-Centered, Cognitive Behavioral Therapy (CBT), Solution Focused Brief Therapy (SFBT) and Dialectical Behavior Therapy (DBT) techniques and interventions. Megan’s strengths include working with issues involving depression, anxiety, stress management, peer relationships, and life transitions. Megan’s interest areas include working with military families. She understands the challenges of military life, spending most of her life as either a child or spouse in the military community. Megan currently lives in the Chantilly .